This page is a translated version of the page Funzionamento di una penna stilografica and the translation is 100% complete. In fact, the forces involved are different: the gravity that pushes the ink to escape from any downward oriented opening, the atmospheric pressure, which prevents any tank with a single outlet hole to empty if there is no way of access that allows the air to enter instead of the liquid (what makes it difficult to quickly empty a bottle when you turn it over), the surface tension", i.e. the characteristic tension of liquids that climb up the walls of a container (the same tension that causes drops to remain attached to the tap or on the surface of a glass). From the first attempts to create a fountain pen, originating in the mid-1800s, the most critical point was to effectively ensure a uniform flow, which would allow the ink to escape from the tank in controlled quantities, which was sufficient to write on a sheet, but not to stain the pockets or the sheet itself. For this purpose the most complex mechanisms of valves, vents, taps etc. were invented, but the solution was not reached until the end of 1800, when it was understood that it was necessary to rely on the phenomenon of capillarity (one of the consequences of surface tension) in order to solve the problem. The basic concept on which a fountain pen is based since then is that of a tank from which the ink can only escape through a very small opening. The opening must be small enough to prevent the ink from escaping spontaneously due to the combination of surface tension and atmospheric pressure. Both forces are necessary, as anyone who has found themselves with the pen dripping in the presence of cracks in the tank or a poor seal of a filling system will have noticed. In fountain pens, this flow control is achieved thanks to the presence of the feeder channel, through which the ink can reach, due to the combined effect of gravity and capillarity, the height of the two wings of the nib. As long as the pen is not used, the surface tension prevents the ink from leaving the feeder and the nib, at least as long as they are correctly mounted and there is no other free passage than that of the feeder channel. The final stretch of the path is made by the ink by capillarity, passing through the channel in the slit between the two wings of the nib until it reaches the tip, and it is this same capillarity that holds it and prevents it from pouring. 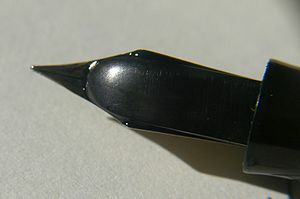 But as soon as you place the tip of the nib on a sheet of paper (or another suitable surface), it is the same surface tension, applied this time also to the contact between the tip and the paper, which causes the ink to deposit on the latter and continue to flow as you write through the slit, at least until (in the case of flexible nibs) you press too much widening it too, so as to interrupt the effect of capillarity and the consequent flow of ink. It is this balance of forces that keeps the flow of ink as long as you keep contact with the sheet, even if this generally does not cause stains because of the low porosity of writing paper that once wet does not absorb more ink on the surface, but as you will have realized anyone who has fallen with a stylus in the pocket after unscrewing from the cap, this is not true for the fabric, which can absorb significant amounts of ink (even from a pen remained open with the tip up). Feeder and nib of a Waterman 52, with an emphasis on the ink retained by the surface tension. The fact that the flow of ink is linked to the effect of the surface tension is what allows a fountain pen (besides leaving stains in the pockets of the shirts) also to write upwards, at least until the ink present inside the channel of thefeeder is exhausted. It is for this reason that many feeders have further internal grooves or sort of small bags that allow to increase this reserve, that is reintegrated every time that, putting the pen in vertical position, the gravity brings back the ink of the tank in contact with the feeder. 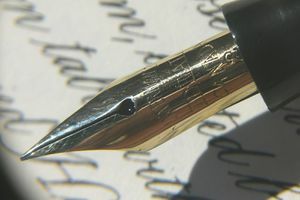 It is always for this reason that a fountain pen, kept until a moment before in the pocket with the tip upwards, is able to write immediately (if the ink has not dried out and if the tip has an adequate curvature). Although all this is relatively simple to describe, the realization of a good functioning depends on succeeding in making this complex balance of gravity, pressure and capillarity work, and it is therefore essential that a correct coupling between nib and feeder occurs. Still today it happens to find fountain pens that present more or less marked problems of operation, like difficulty to start the writing or ink losses. It was in this field that the innovation introduced by Lewis Edson Waterman took place, which is often referred to, in an unfounded way, as the invention of the first fountain pen. In order to improve the transmission of the ink towards the nib, he made a series of engravings on the feeder creating a sort of "channels" on which the ink could flow by capillarity without overflowing and leaving enough space for the air to enter the pen tank. He thus produced one of the best and most reliable feeder of his time, whose success is at the root of the exaggerated claim to have created "the first practical fountain pen".